New Year’s resolution! OK – I know the statistics on failure but this is for real. I’m walking right back to the eight stones of pure woman that is still cowering within me. I can never give up writing. I can never give up cuisine. I can never give up walking in my new treadmill office. If I stop I shoot right off the end. Imagine that in the middle of the first moment of passion after twenty pages of foreplay. It could be the first ever case of keyboard interruptus. Just think of the Amazon reviews! So, here’s the low down on my brand new home workplace set-up for healthier writing habits in the years to come…. The plan is to exercise as I write. Standby for scenes with lovers strolling through meadows and shopping malls. My office is a corner in the dining room – there is limited space and we have to be able to eat in there, without it feeling like a gym. (I can get a bit warm but it is a well known fact that romantic novelists do not sweat). I’m also on a limited budget. I’ve pulled in all my Christmas prezzies as cash donations before Santa arrives and raided the piggy bank big time, but I’m all set for those New Year Resolutions. Of course you could go for the Rolls Royce solution and get a fully-branded high velocity, bells and whistles ‘walking desk’ … but these run out in the region of $2000/£2000. Apart from costing all my writing royalties forever, they also have the disadvantage of coming as a solid homogenous lump. If (like me) your bones can’t immediately face 12 hours on the go whilst you’re scribing – you’d need another separate desk and a chair to transfer to during ‘recovery writing’ periods. 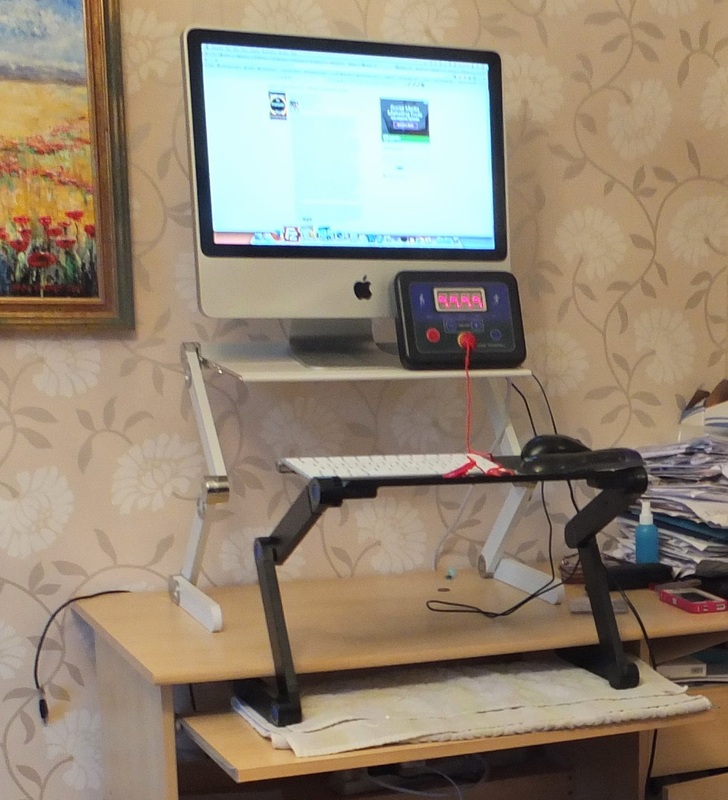 My solution, although very much DIY, uses my usual sitting desk and converts in less than a minute to the new all-healthy version. 2. 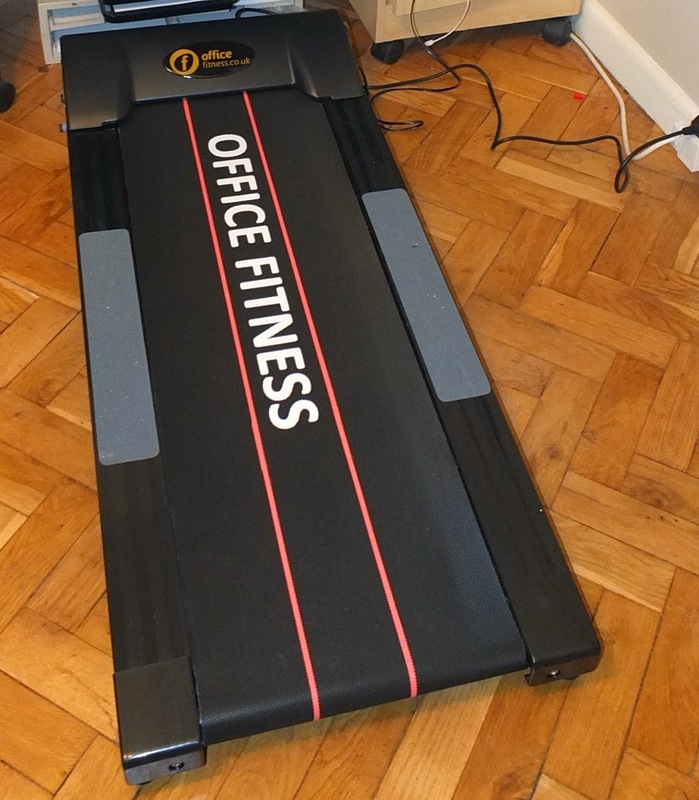 Office Fitness powered Walking Treadmill – currently on Amazon UK at £269. This is about 1.25m long and 0.6m wide and fits into the knee-hole space of a desk. It has a little screen to tell you how long/far/calories have been achieved. It also has a safety magnet so if you should fall off (!) the power is cut. There are similar products on Amazon USA. 3. A method of raising up your work zone – I found that standing up and on the treadmill, my eye and hand levels were about 0.4m above my usual sitting position. 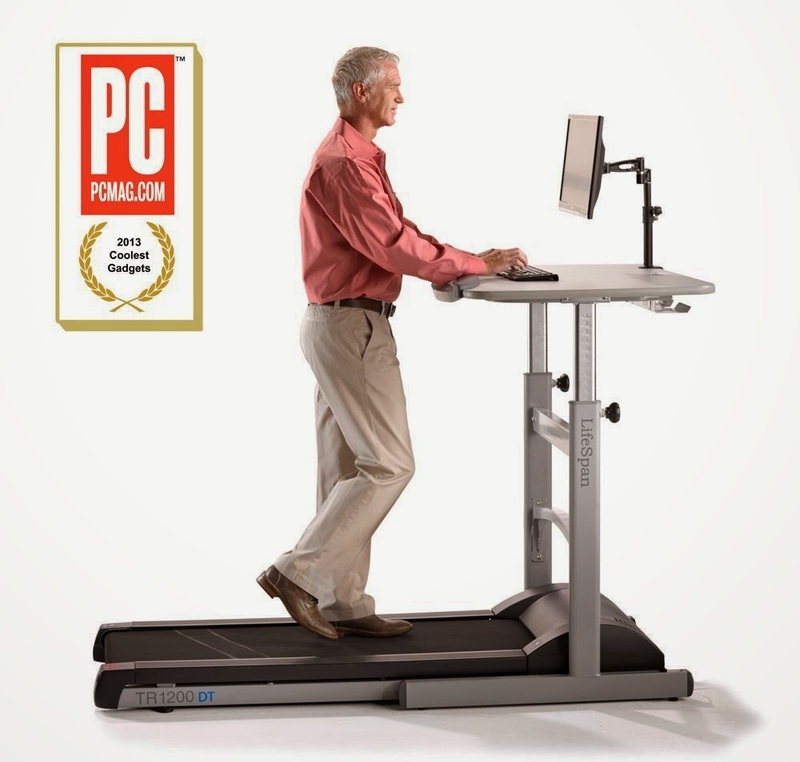 Not great for back/neck/wrist health. I needed to find a way of lifting up my workstation and keyboard. Again there are some very sophisticated solutions available – the wonderful whizzy Varidesk has hinges and levers that let you do this with ease but these are not cheap either – around £300. I opted for a much cheaper, strong, extendable shelf. This gives me a sturdy base to raise my Mac workstation, which is quite heavy. The adjustable legs get it to the correct height. A bit of a fiddle initially, but once set up it just stays in position from then on. 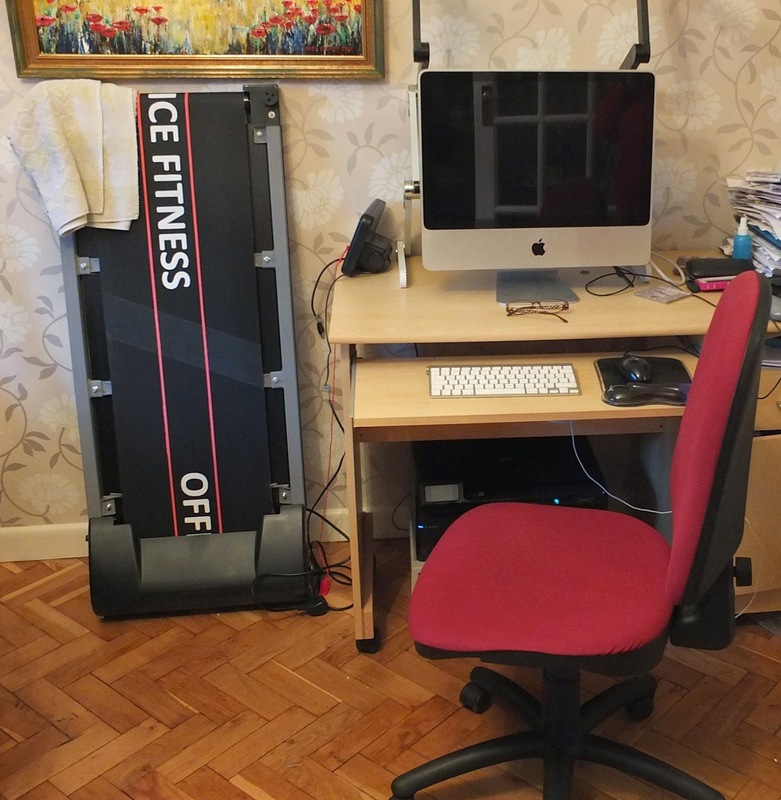 The new shelf is quite slim and sits happily behind my Mac whilst not in use – I just lift the workstation into place when I want to use the treadmill. My keyboard and mouse are separate and need raising up too – I have a second extension shelf that sits on my desk and I’ve adjusted that to get the perfect working height as well – again about 0.4m. The extender shelf for the keyboard was a cheaper version at £14.99 from ebay – not as robust – it definitely does wobble a little so maybe I should have just bought two of the ‘Posture Stands’, but it works for now. When I finish my session, I simply take the computer off the shelf and lean the treadmill up against the wall. I stow the extender shelves behind my workstation on the desk and wheel my chair back, for a nice relaxed few hours… before doing it all again in the afternoon. My plan is to start doing two, one-hour sessions a day, at the slowest speed – 1km/h – to see how the poor old bods reacts to the movement…. watch this space for news of my progress! Happy and Healthy 2015 to all who pass this way! Emma Thinx: Love can walk out. True love runs back, but never out. 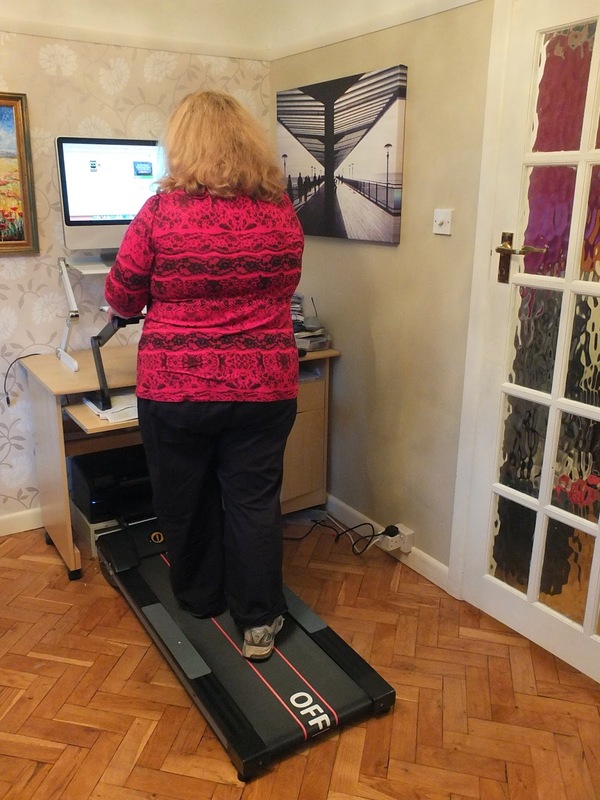 This entry was posted in Exercise, health, keeping fit, new year resolutions, standing desk, treadmill desk, walking desk, writers by emmacalin. Bookmark the permalink. You go girl. Bert and I are rooting for you. Who knows what sorts of novels may come out of it to boot. Have a grand holiday and then get walking. It may lead to even greater creativity.